I broke down and bought a Kindle. Not that Kindles are evil. It’s just that the thought of not holding on to a book while I read usually sends me into this internal struggle. Old verses New. History verses Progress. 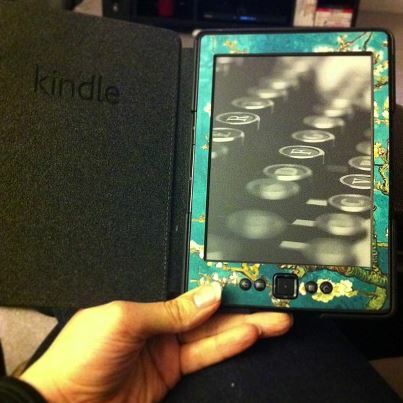 Paper verses….well whatever is used to make up a Kindle. But after several talks – and we’re talking the crazy-talk-to-yourself kind – I finally took the leap and ordered it. Sporting a fab decal too! It’s pretty, I’m not gonna lie. So here was my thought process when purchasing a Kindle. I realize that no one is asking for me to justify myself but for some reason I feel the need. But kudos for finally making the move… I know I have to do it soon too!! How many books do I read at a time, do I need at my fingertips? Purely monogamous reader me.. I’d like to enlarge the typeface though as I’m getting farther and farther away from the page. Yes, I agree, stronger glasses would be an easier option. I keep saying, once I’ve read all these paperbacks at home.. then I find more to entice me to buy. Having done my equivalent thought process, I have come to the same conclusion as you. I want to read and support the books of my writer friends who are mainly e-published. Better start saving..
Good luck! I’m sure you won’t be sorry. I bought the very first version of Kindle (back when it was soooo much more expensive) and my dog broke it about 9 months ago. I tried to live without it. I went to the bookstore but it wasn’t the same anymore. I practically got carpal tunnel holding those big books with one hand. Broke down and bought the Kindle Fire and I’m so glad I did. You will love your Kindle. congrats.